Colordyne 1600 Series S Inkjet Sheet Printer | Arrow Systems, Inc. 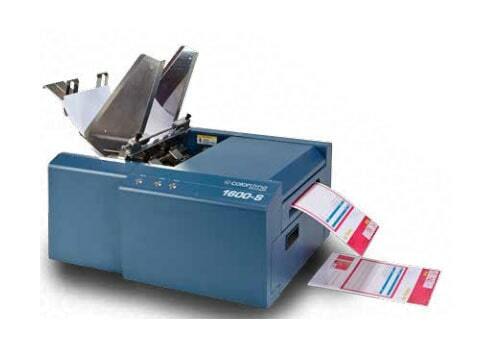 The Colordyne 1600 Series S is designed for personalizing and branding back office documents, envelope messaging, and promotional material printing. Now add color to business documents and forms, and create promotional materials in-house. In one step, add color to your back office documents, integrate variable data, and print only what you need, only when you need it. Perfect for print shops, colleges and universities, direct mail houses, and consumer product goods companies. The adjustable media guide quickly accommodates for sheets and envelopes of different shapes, sizes and widths between 3” to 9.5” (76 mm to 241 mm) and up to 0.02” (.5 mm) in thickness. Seamlessly merge designs and layouts with text, images, barcodes and database information to handle the needs of security packaging, tracking, personalization, and micro-segmentation.